I have been thinking it might take MONTHS to finish the nursery! I still need to get pictures taken of this baby, print the pictures and hang them. I Also want to order her name in vinyl to hang over the crib. Presently, I’m 6 days from my due date! All my babies have come about 2 weeks early. So this is NEW territory for me. I feel hard little body parts all squeezed inside of me. I am having a hard time figuring out if I am having an contraction or if I am feeling a little foot, back or leg?! I can't complain, I have had a great pregnancy, but I am READY to meet this baby girl and see who she looks like! I am getting soooo excited!!!!!! 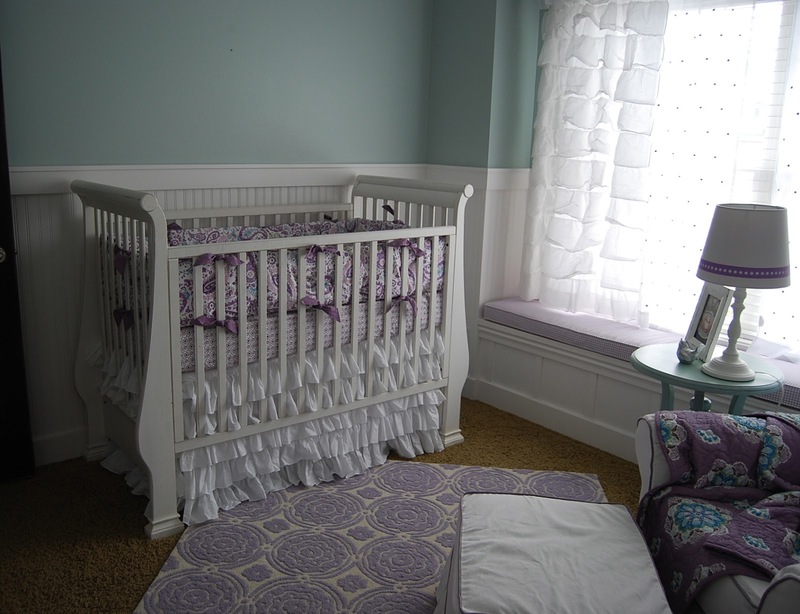 I’ve received a few emails about when I was going to post pictures of the nursery. So here are a few pictures I shot today. 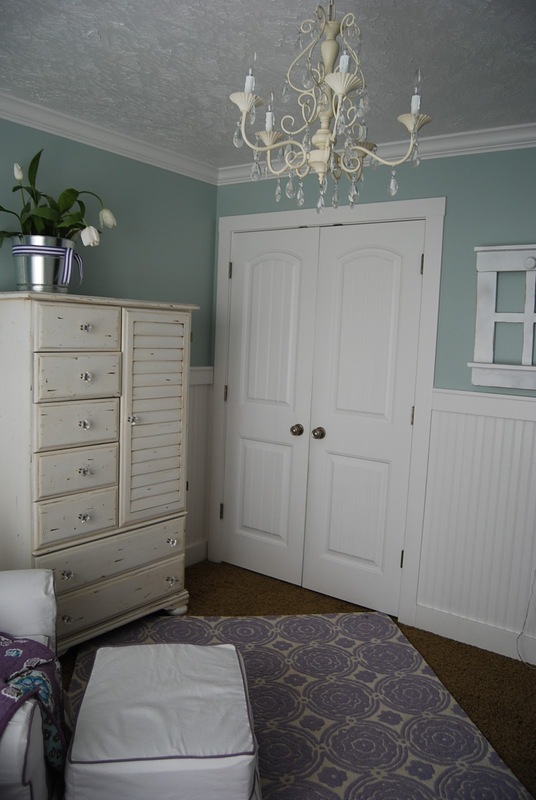 The walls are totally blank, as well as on top of the armoire, but I hope you can see my vision for the nursery! I REALLY wanted a super clean palette, so I used A LOT of white (which I LOVE),I am SUPER excited about how it's turning out. I never thought I was a PURPLE person, but I am really enjoying the calming affect it has on me! Anyways...I think I have done all shades of pink over the past 10 years and I wanted something new. The end table is an old piece I already had, I painted it to match the room. 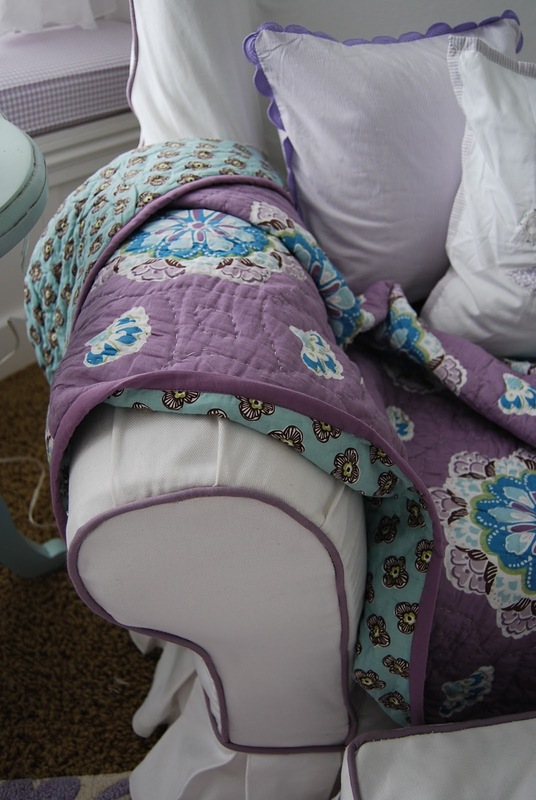 I had a slipcover sewn for my existing rocking chair! 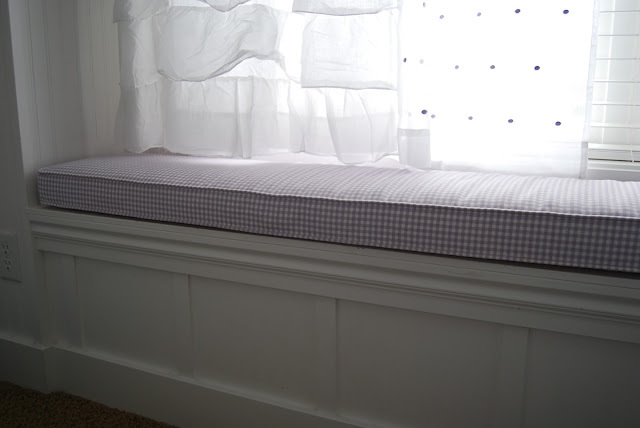 I also had a window cushion sewn to match the room. I found the fabric for that at Home Fabric for only $2.00 a yard! It is adorable! I love the color choices...it's so bright & fresh. I hope your sweet little girl arrives soon! I've always gone at least a week early with all of my kids too! Good Luck!! Super cute Heidi! Thank you for sharing. Hoping your new bundle of joy arrives healthy & soon! It is beautiful, and I just love it! Good luck with all you have coming up, and enjoy that baby girl! This has got to be the most beautiful nursery I have ever seen. You;re right - the purple is unexpectedly soothing. What a nice touch it adds! 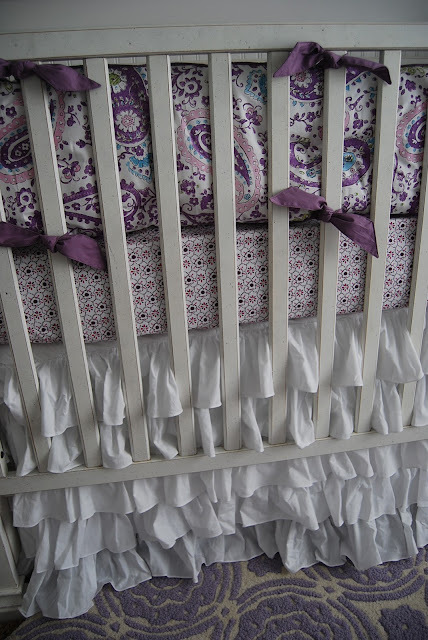 My favorite things were the hand-made ones, such as the crib skirt, curtains and slipcover. You showed great restraint, too. Bravo! I stumbled upon your blog today. 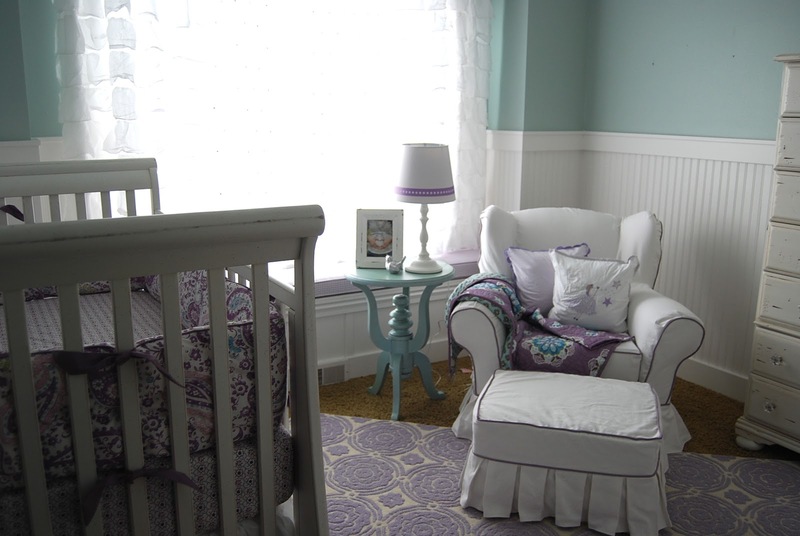 This nursery is darling!! Best of luck with your new little one. Hi! MegJill's mom here - Ditto to everything she said. It's gorgeous! Lovely, peaceful place. 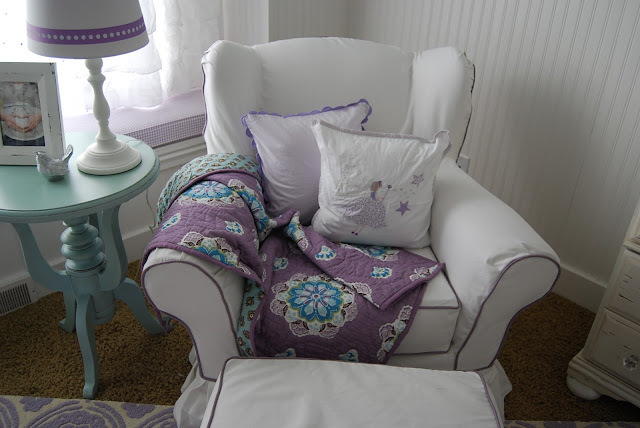 Did the little purple fairy pillow come from Downeast Home? Is that a local store, ie no online? I'd also love to know the blue paint color...LOVE! LOVE LOVE LOVE!! I can't find the princess fairy pillows. Where did you get them? Would you mind sharing the paint color? It's gorgeous! RAINWASHED from Sherwin. Its A LOT lighter in person!! gorgeous! My husband and I are using this room for inspiration! :) where did you get the rug?? It's perfect!! Pottery Barn Kids... 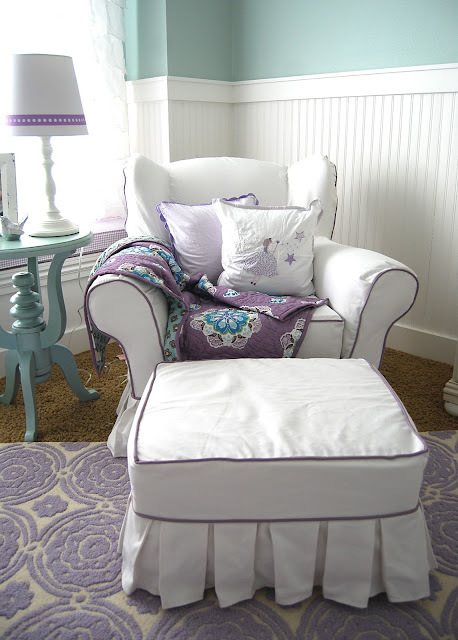 But there is a rug on overstock that looks just like it, half the cost! I have a link on my Facebook page! The white curtains, are they black out? Trying to find room darkening curtains that are still light and pretty. Thank you. 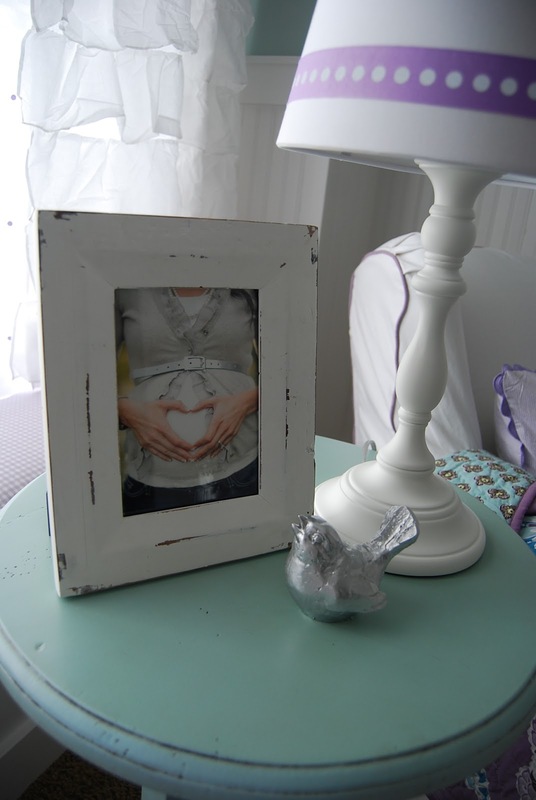 I love the framed pictures...What size are the prints that you put in the frames? I seriously LOVE the purple and turquoise together! Pinning! Please share the wall paint color! This nursery is beautiful! Great job! 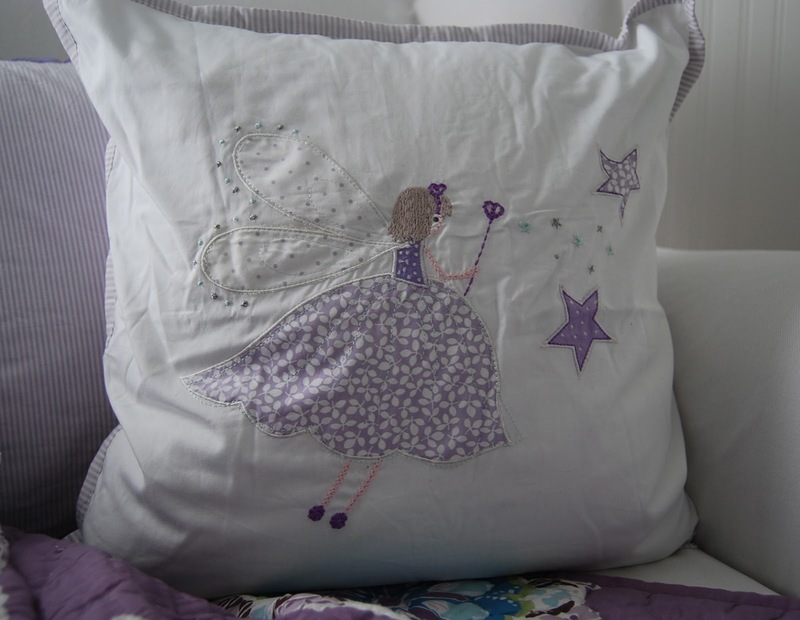 Where is the fairy pillow from? I just love it!! I stumbled across this gorgeous nursery via Pinterest. Beautiful color combination! It's a great alternative to the traditional pink for girls. We are pregnant with baby #3 and are going to be surprised about the gender so we are pinning ideas for both sexes. This one is definitely at the top of the list for a girl! Do you still have the link to the rug on Overstock? I scrolled back to 2013 on your FB, but didn't see it. Thanks! What a beautiful nursery. I love the colors. I wanted to let you know that I am featuring this in a nursery roundup if you don't mind.